In college and graduate school I was working mostly with Anthony Braxton, Jay Hoggard and Jackie McLean, over at the Hartt School of music. I also studied with people like Alvin Lucier, Ron Kuivila and Pheeroan akLaff, while doing my best to take advantage of the performance courses in South Indian and West African musical traditions that were offered at Wesleyan. It’s hard to sum up the importance of the 6 years I spent at Wesleyan and even harder to know how much of it had to do with the fact that I was functioning within an academic environment. I think it’s safe to say that when I arrived at Wesleyan as a freshman I was pretty squarely focused on the music of people like Jackie McLean and John Coltrane. By the time I graduated, in 2002, I had been exposed to an extremely broad set of musical traditions. And also given the tools, by people like Anthony Braxton and Jackie McLean and Jay Hoggard, to begin defining the parameters of my own music. This week marked what I suspect is the last hurrah for compact discs – the re-release of the entire Beatles catalog, with new mastering, new photos & booklets, mini-documentary videos. I was working part-time at a record store back in 1985, when compact discs were first rolling out. Our store had a smallish selection of CDs, mostly classical recordings – other genres had yet to really roll out on disc. We mostly sold LPs and cassettes. Now, about 25 years later, the CD market is drying up fast. Digital downloads are making up a large and increasing share of the music market. While I understand it, I do miss record stores. Since I’m the kind of guy who still has LPs and 45s along with lots of CDs, I picked up a few Beatles titles for old times sake. The one that’s speaking most to me at the moment is ‘Beatles For Sale’ from late 1964. The lads had been working hard, touring and recording all year (oh, and they made a movie too! 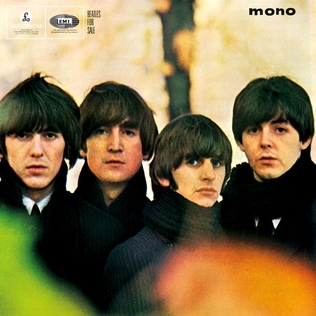 A Hard Days Night), and this one came out at the end of the year in the UK (it was chopped up for the US market into Beatles ’65 and Beatles VI). It’s a combination of originals and covers, basically the last time they’d do covers on record. According to the recording notes, on the last day of recording on October 18th, they recorded 7 songs in one long session, 5 covers along with “I’ll Follow the Sun” and “I Feel Fine”. Amazing! But I think the sting of the album comes right at the beginning, where a newly Dylan-influenced Lennon indulges in a little self-pity in his powerful trio of opening songs: “No Reply”, “I’m a Loser” and “Baby’s in Black”. I’ve made it to a few shows this past week, which have been blasts of pure rock and roll. On Wednesday night, a visit to Slabtown, which feels a bit like someone’s big basement even though it’s at street level, where the Rock N Roll Adventure Kids from Berkeley were headlining. Their MySpace page lists the following influences: Traditional Fools, Link Wray, Bo Diddly Hasil Adkins, Cramps, Nobunny, Stooges, Tav Falco, Screamin Jay Hawkins, Legendary Stardust Cowboy, Coachwhips, Buddy Holly, Little Richard, Gun Club, Gories, Drags, V.U. Take all that crazy inspiration, mix it up in a two man band with drums and guitar, add in a lot of manic energy. Listen at your own risk. Then it was over to Dante’s for Pansy Division and headliners The Avengers. The Avengers got together in 1977 in SF, and have had a couple reunions in the recent years. Original members Penelope Houston and Greg Ingraham were on hand, with the rhythm section borrowed from PD. PD started in 1991, and appears to be going strong (the sequin dress costume change really kicked things up a notch!). Both bands had some great punk energy, old-school. Rock and roll lives on! I found out about it from the band project of the same name, and it is indeed a pretty spot (photo by Christopher Monsere). That night we just made it to the set by Black Joe Lewis and the Honeybears at Mississippi Studios. These guys out of Austin TX play a pumping brand of soul and blues numbers that was real good fun. Then on Saturday we headed south, passing through Eugene, where I picked up this book on Andy Warhol by poet John Yau. We were on our way to a town called Florence out on the coast. Todd’s mom lives there now, and we were able to navigate to her house just on the basis of the address (small town!). That night we walked over to ‘Old Town’ which is a nice street of restaurants and shops on the banks of the Siuslaw River. On Sunday morning we went to a church service at the Church on the Rock, where Todd’s mom likes to attend. The service included several songs with a band at the beginning, then a sermon based on Matthew 26. I have to admit I have not been to a church service in decades, and found this one interesting at least in terms of lessons about human nature if not all the biblical specifics. In the afternoon we drove a few miles north, first stopping at the Sea Lion Cave, which unfortunately has been abandoned by the seals as of a few weeks ago! So we went a bit further up to Heceta Head Lighthouse, a very pretty spot on the wild coast. 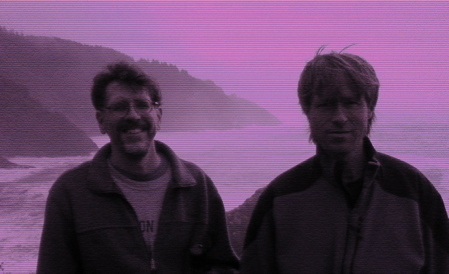 My camera started acting up, and I think perhaps the sensor has gone bad, but finally was able to get this lo-fi picture, Todd and I by the lighthouse. After that I dropped Todd and his Mom off at her house, then headed home. All went well for awhile, then a electric warning light came on somewhere along the way. I hoped to make it home, but near Salem my speedometer suddenly dropped down to zero, followed soon after by the tachometer… and soon I had to pull off to the side of I-5 as the car was dead. As usual AAA responded well, and we determined that the best thing would be to tow it to Portland, and get it fixed later (probably the alternator has gone out). So I made it home a bit later than expected, but no real damage other than $107.50 in towing fees. Today I went to a mid-day yoga class, much needed on this Labor Day. Finally saw the master at work. 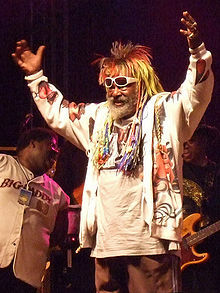 George Clinton started in the early sixties with The Parliaments, got Parliament/Funkadelic rolling in the seventies, and has been doing his thing for just about my entire life! Last night the mothership landed at the Crystal Ballroom here in Portland, and the sold out crowd was extremely enthusiastic. The big band can play just about anything, it seems like, so there was some funk, a little rap, a long guitar instrumental, soul, and whatever else they do. Highlights for me were “Flashlight”, “One Nation Under a Groove” and “Atomic Dog” at the end of the long set. There was a nice rendition of “Dr Feelgood” in an Aretha-style in the encore, sung by newest member of P-Funk, Mary Griffin.